Thomas Vaughan (1622-1666) called Johann Trithemius 'the dark disciple of the more dark Libanius Gallus'. Since Vaughan's statement more than 350 years ago this darkness has neither been lifted from Trithemius himself nor from his alleged teacher Libanius. Their joint master, the magical hermit Pelagius of Mallorca has entirely sunken in oblivion. The attention of magical currents has long been caught in the tension between aiming to claim 'authentic lineage' on the one hand, and needing to prove functional efficacy of its praxis on the other. As the unfortunate result there has been incredible little appetite by practitioners for objective research into the hybrid nature and constant cross-pollination of its textual sources and their historic development. The mere fact that such critical figures as Johann Trithemius and his alleged teachers Libanius Gallus and Pelagius Eremitæ have not received broader attention is a direct result of this dynamic, yet deeply crippling tension. Within the scope of the Holy Daimon Project dedicated research on Johann Trithemius and his magical works takes a central position. So far the first full English translations and analysis of Pelagius' Two Books Of Knowledge and Name of one's Good Angel as well as The Powder of Pelagius have been published online. Substantial additional material has been completed and is waiting for publication in print at a later point. The following short grimoire came into focus as part of the above research. As we will see, it should be of particular interest to the modern practitioner for several reasons. Despite the fact of its spurious attribution to Trithemius, however, it certainly is of interest to the student of Trithemius' magical works. Not only does its title make direct reference to an important text of the dark abbot, but it also shows significant resemblance to the Powder of Pelagius which Trithemius describes in his Antipalus Maleficiorum. While the latter is a talismanic concoction and of protective nature, in the following text we encounter its active mirror image: the instruction for the creation of an astral 'universal materia' that can be turned into the carrier substance of any kind of planetary magical operations. While Trithemius already during his lifetime gained the infamous reputation as a man well versed in the dark arts, it was his contemporary Dr.Faust who later ages remembered as the ultimate model for the morally highly ambivalent, goêtic mage of the Late Middle Ages. Nevertheless, during the 16th and 17th century a not insignificant amount of scribes aimed to add a color of occult authority and reputable lineage to their written remixes by invoking Trithemius name on their title pages. Examples of these are Tractatus chymicus, Veterum sophorum sigilla et imagines magicae..., Philosophia naturalis de Geomanita or most famously The Art of Drawing Spirits into Crystals from Francis Barrett's The Magus (1801). The General-Key has to be read as part of such a genre which is spuriously attributed to Johann Trithemius. The abbot of Sponheim was never shy to express his passion for all kinds of knowledge, including the magical. He even referred to himself as a 'philomagus', i.e. a lover of magic (Arnold, Addittamenta, p.249). However, the abbot's own magical writings are either of highly complex nature as in his Steganographia, blatantly criminative as in his Antipalus Maleficiorum, or - as we encounter through the voice of his teacher Pelagius - marked by a deep and pious mysticism. In whichever way his magical ideas present themselves, Trithemius texts are never short. It is in this last quality that we might encounter the most obvious contrast to the grimoire at hand. The most curious aspect of the General-Key is it's highly compressed nature: Rather than presenting a ritualistic map of a single sequential process, its first part in particular provides a concise summary of the key premises of Western Magic as such. As we will see, even magical textbooks written two-hundred years later still show a similar structure as well as alignment to the same core principles. At least in this respect its title holds true: the short 18th century treatise indeed provides a most reduced General-Key to the art and science of sympathetic magic. Click the buttons below to either explore the first critical edition of the General-Key - consisting of the images of the original 18th century document, the German transcript as well as an English translation - or to read the English version only. Alternatively, feel free to continue to read on this page and to deep dive into its detailed analysis right away. Johann Trithemius indeed wrote a short treatise called General-Key. Yet, instead of aiming to provide a general summary of key principles and instructions of sympathetic magic, the abbot's key was intended to unlock the cryptographic practices hidden in his famous Steganographia. The original Latin title of this treatise is Trithemius Clavis general. triplex in libros Steganographia. While written already in 1500 it was only first published in 1621. Trithemius points out in his introduction to the third book of the Steganographia, that he had learned the art of combining and overlaying magical and cryptographic techniques into a single text from an ancient master called Menastor. The latter had particularly leveraged the 7 planetary spirits, their corresponding 7 angels as well as 21 sub-ordinate spirits. Today we know this authority never existed and what we encounter in this highly complex text is Trithemius' own original creation, much of which he received through visions. Obviously, in terms of complexity the General-Key of 1750 by no means resembles Trithemius text of the same name. Quite the opposite, as mentioned before, the younger text impresses through its extreme conciseness. What both texts have in common though is that they are magical rule-books in the truest sense - both attempting to decipher a genre of texts that were famous for their inaccessibility. The short preface covers 1.5 pages and contains a general warning not to use the secrets revealed in the text for wicked purposes, as otherwise the practitioner would 'feel Heaven's revenge'. Furthermore, it points out that the essential principles explained on the following pages are crucial to unlocking and avoiding misunderstanding of 'all the secrets which the old ones have left us in large quantities'. Rather in passing the preface then offers its first, and possibly most important key to all operations of magic: to perform them with virtue. Read through a historical lens such warning is understood as part of the common defence script of Late Medieval authors on magic: insinuating that their texts were part of a natural or theurgic rather than goêtic tradition of magic. More specifically this meant, they put the responsibility into the hands of the practitioner: As it was the latter's own moral intention which determined how these secret sciences would affect both the world around them as well as themselves. Read through the lens of a practitioner, however, this short advise indeed contains the possibly most important key of the magical art: Spirits are non-corporeal beings in a physical sense; which is why when approaching human beings they do not see their corporeal bodies first. Instead their initial perception gives them an impression of the moral make up of the practitioner who is calling upon them. More critically, many kinds of spirits simply cannot convene and commune with practitioners, unless the latter have attuned their spiritual state to the one of the spirit. Such tuning process is not performed inside the magical circle, but well outside of it: It is not done through ritual, but through diligent preparatory phases of withdrawal and ascesis. For the magical seed to open the practitioner first has to turn their everyday life into the topsoil that provides the adequate conditions. Thus calling to the practitioner to renounce the vices and perfecting their virtues - both in their magical motivation as well as in their general way of life - was not a peripheral adornment of Christian Medieval addition. It was the heart of the magical process itself, accomplished on a spiritual realm, by attuning the spirit of the operator to the spirit they aimed to be in communion with. Unsurprisingly, as we discovered in our analysis of the Two Books of Pelagius the Hermit, Trithemius himself was deeply familiar with this key requirement and repeatedly pointed it out in his own magical writings. The following chapter now provides the condensed summary of magical premises mentioned above. First, it mentions that none of the magic it aims to reveal can be achieved through the operator themselves. Instead magical agency resides in two critical forces: the one unified God and its holy trinity, as well as the fixed stars. The way pagan astral magic is integrated into a Christian paradigm, is by assigning it the same role as traditional angelic forces: By positioning them as 'secondary causes' [causa secunda], i.e. mediating agents between the heavenly Creator and his earthly creation. The differentiation of first and secondary causes forms part of a philosophical (and later on theological) debate that is known since the time of Aristotle. It essentially wrestles with the premise of free will as well as the thorny subject of theodicy, i.e. how a benevolent creator god admitted evil into the world. By assigning multiple spheres or stages of causation a continuous degradation and diversion of the original divine will was assumed. Thus gnostic techniques of elevating one's soul to reconnect with realms closer to the 'prima causa' make up the main body of the Western mystical tradition and informed much of its iconographic expressions. The author then clarifies that the seven fixed stars have to be 'coerced by divine magic' so that they can positively affect many unusual things. The German word for 'coerced' (gezwungen) is quite clear and leaves no doubt about the forceful nature implied. Seeing this word in this context is slightly unusual, as traditionally the expression is used to describe goêtic practices and the coercion the operator practices on supposedly dangerous chthonic spirits. The choice of word becomes clearer as we read on: the planets are now described according to their main qualities and ruling domains. They are presented as either malevolent (böse), benevolent (gut) or mixed (gemengt). Unusual for such a short treatise the text does not oversimplify the agency of the stars, but rather manages to present them similar to the classical four temperaments, each one of them ambiguous within themselves and depending on the context and intent in which they are being approached by. It's in light of such ambivalent astral nature of the stars that the term 'coercion' unlocks its actual meaning: The word 'coercion' is a combination of the Latin words for 'together' (co-) and 'restrain' (arcere). Very similar to the etymology of the German word 'zwingen' (deducted from 9th century 'twingan') it describes a process of forcefully encapsulating something or someone into a confined space, a process of narrowing, compressing and ultimately taming an unruly force or being. So here we find the magician presented as a tamer of celestial spirits, operating not according to their own ego, but in accordance with the divine will. Approaching magical practice from such a vantage point necessarily introduces a strong mystical emphasis. The mage is as much changed as part of the process, as the spiritual being they are working in partnership with. 'Coercion' in such context is not a term implying the application of brute force, but of mastership in the craft - which can only be gained by coercing oneself just as much as the forces or beings worked upon. After laying out these short essential premises the grimoire launches into its twelve-point summary of operational rules for any kind of astral magic. Here is the full list, with an additional column highlighting the respective principle illustrated by each statement. Unsurprisingly, the list contains the general rules of mago-mystical operations in the Western tradition - ritual devotion, purity, chastity, isolation and secrecy. 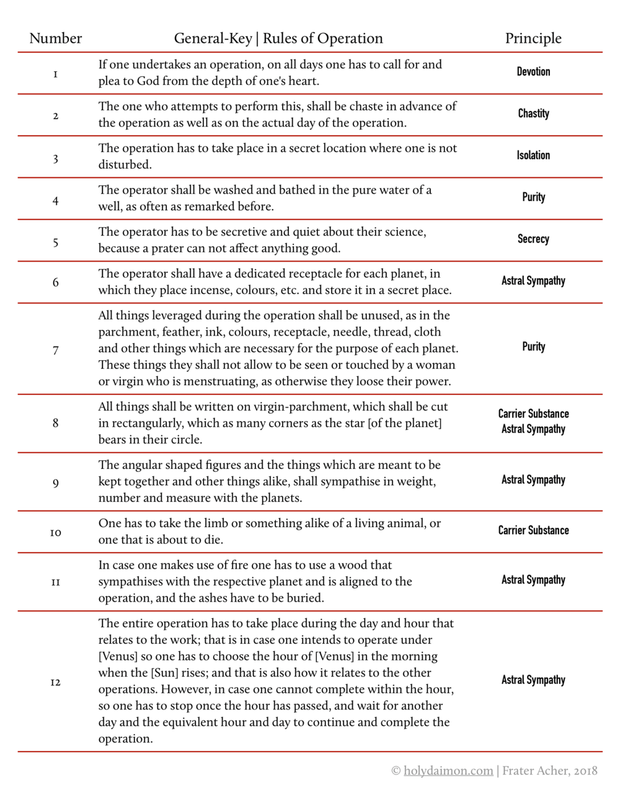 However, in the second part of the list we come across ritual concepts that seem much more attuned to modern guidebooks: The instruction to keep the required materials for each planetary operation strictly separated from each other in dedicated boxes; as well as the description to even store all the tools required in a dedicated set per planet. The author establishes the principle of keeping the planetary paraphernalia isolated and stored according to their astral sympathy. Underlying these rules we actually discover two separate operating rules which we still find in most modern magical primers: (a) All elements that contribute to the creation of the magical potion, talisman or ritual are treated as virgin, natural substances. These can be quickly diluted in power and purity if exposed to substances or even times not aligned to the planetary sympathy they are intended for. Not unlike the sensitivity of photo film to sunlight, so these magical tools are understood to be equally sensitive to whatever they are exposed to. And it is the job of the practitioner to ensure they are only touched by influences directly aligned to the astral sympathy under which they are meant to operate. (b) Secondly, by reading the list of mentioned paraphernalia carefully, we realise how these materials, if used collectively, are well suited to induce a state of ritual synesthesia: Color stimulates our sense of sight, parchment, feather and needle our sense of touch, the smoke of burnt incense our most primal sense of smell and the angular shape of the talisman, mathematically correlated to the number of the respective planet, stimulates our cognitive mind. Today the term synesthesia is often used to describe a relatively rare neurological phenomenon where in some people exposure to one sensual stimulus involuntarily triggers a seemingly unrelated secondary stimulus. E.g. people hearing a certain sound immediately see a particular color, or people exposed to a certain type of touch simultaneously perceive a certain smell. In the liberal arts, however, the use of the term has survived in a more ancient form; one much more related to the instructions we find in the General-Key. Here synesthesia describes 'the simultaneous perception of multiple stimuli in one gestalt experience'. In other words: the concept describes the attempt to stimulate as many of our human senses as possible in an aligned and congruent way, in order to trigger a deliberate and targeted experience. Think of each of your senses as a lock on a door to a distinct reservoir of power. By unlocking all of these doors at the same time and with a unified intent, access is granted to all sensual power reservoirs of human focus and attention at once. It is in this sense that ritual synesthesia (different from its neuro-biological or artistic siblings) has been leveraged for centuries to consciously create and trigger ritual peak experiences. An important secondary gain of this technique was that such ritual peak experiences not only leveraged all of our reservoirs of distinct 'sensual power', but they also were easily repeatable as well as safe from being triggered by chance in everyday situations. The ritual preparations just as much as the ritual itself turned into the unique map that unlocked a particular state of mind, one where all senses were switched into a congruent mode of perception, tuned to one single astral being alone. It was H.P.Lovecraft who once remarked, it was the biggest gift of the gods to mankind that the former didn't need to understand creation in order to use it. We are reminded of this quote when looking back at the seemingly inconspicuous instructions of the General-Key. Activating a state of ritual synesthesia by combining a unique set of shapes, colours, incense, incantations and time has to be considered possibly the most important core principle of Western Magic - and yet it is rarely ever described explicitly in grimoires before the second half of the 19th century. The example of a sympathetic ritual given in the grimoire roughly covers half of the text, i.e. 5 out of its 12 text-pages. It is explicitly mentioned that the instructions for a Venusian love potion are meant as a general blueprint, i.e. alternative rituals for the other six planets and their ruled attributes can easily be derived from it. The given ritual act can be differentiated into seven distinct steps or phases, which the below table provides an overview of. It should be noted that the actual process of creating the love potion from its various ingredients already is the ritual act. In such sense our text stands much closer to the practical traditions of folk-magic or witchcraft, than classical ritual magic where the preparation of a planetary talisman would be distinct from the elaborate ritual practice of consecrating and activating it at a later stage. Unsurprisingly therefore, except for the mentioning of a knife attributed to the planet in question the General-Key mentions no other of the classical Solomonic paraphernalia such as a magical circle, chalice, robe, etc. Assuming the right time and 'tuning-in' of the operator are respected, the General-Key works off the implicit assumption that the spirits are already present amongst men. As we can derive from the text, what planetary spirits need first and foremost to work in human ritual union are three things: (1) an adequate carrier substance to impress their influence into, (2) a conscious addressing of the operator as well as (3) a fair deal struck between both parties. They do not require the mage to be dressed in a funny way or to be surrounded by seemingly baroque levels of paraphernalia. After determining the appropriate astrological time for the ritual, right away the text leads into a ritual act that easily can spark controversy, i.e. the killing of an animal attributed to the respective planet. For the modern reader it would be easy to misunderstand such sacrificial animal slaughtering as evidence of a rather sinister or unethical motivation. Indeed, everyone of course is free to judge things according to their own ethics and perspective. To better understand the historic background in front of which this ritual should be read, however, it is important to mention that home slaughtering was a most common practice in most European cities until the middle of the 19th century. The reason why it was abandoned in the second half of the 19th century by no means related to ethical, but to considerations of hygiene as well as the ongoing nuisance caused by the stench of killed animals in the city streets. Our text was written at least 200 years earlier. In the late 17th century the private killing and preparation of a small animal such as a chicken, lark or char was not considered offensive, but rather a basic domestic skill any adult was required to possess. Therefore the instruction to include certain animal parts in an act of 17th century sympathetic magic should be read no different from the instructions to include certain parts of a plant or particular minerals. Now if at all, the offensive aspects of an animal sacrifice at the time would have been (1) the fact that the slaughtering was integrated into a spiritual ritual, which was clearly a practice justifying strong heretic suspicion, as well as (2) that its precious food-source would have been 'wasted' for any mundane use. This latter aspect we see emphasised in the instruction to also burn all the remains of the dove and bury its ashes: no part of the animal were allowed to be used in any other way than contributing to the ritual act. In such sense the offering of an animal from one's private stock - especially if it was of more precious nature such as a chicken, pig or goat - would have truly been an act of personal sacrifice. The first of the two powders is crafted from the heart's ashes of the sacrificial animal, the juice of the leaves and ashes of the root of the related planetary plant, some juice of myrtle as well as some powdered ambergris. The latter ingredient requires additional explanation, as authentic ambergris would have been very expensive even during the late 17th and early 18th century when whale hunting became a major economic factor across European industries. Instead of the real organic 'grey amber', a substance taken from the digestive system of sperm whales, the term ambergris often was confused with amber as in the fossilised tree resin mainly from the Baltic region. It is thus likely that the powder mentioned requires the addition of pulverised amber, not the costly organic substance taken from sperm whales. The second powder is fashioned of gagate, feathers or hairs of the belly of the sacrificed animal, the collected blood of the sacrificed animal, as well as the curing smoke of fire made from myrtle wood and a pill of the first powder. Here the most obscure ingredient for today's reader likely is gagate. The actual term used in the German text is Agtstein which in itself is an even more ambiguous word, as illustrated by this German vernacular dictionary entry from 1793. No explicit lead is provided by the General-Key which translation of Agtstein is intended - whether as gagate or amber. However, just two sentences earlier the author used the term 'ambra' to indicate the tree-resin amber. Thus, if he had intended to instruct for the use of amber again in the second powder, it can be deemed highly likely he would have used the same term. As he chose Agtsteininstead, we think it is likely he used the latter term to refer to its alternative meaning as in gagate. This would also lend stronger polarity to the two powders created, as the first included the 'yellow amber' whereas the second leveraged its opposite, 'black amber'. But what exactly then is 'black amber'? Gagate is better known under its alternative term jet and refers to a compact and very light carbon fossil. It is found as a lustrous, relatively sot stone which is easy to shape and engrave. The term ‘gagate’ stems from an ancient river in Lycia where it was once mined. However, it was already known by the Ancient Egyptians who created polished black mirrors from it, as well as the Ancient Greek who turned the fossil into amulets, bracelets and rings. In Medieval times it was known to hold softening and dissipative healing powers which is why it was believed to take effect against migraines, toothaches, stomach pain or epilepsy. It was also used as a popular and affordable material to create talismans and believed to ward off demons, dismantle spells and disempower the devil. Powdered gagate was already mixed into potions to be swallowed or applied externally, which can be understood as an early predecessor of modern alternative tar-therapies, e.g. against psoriasis (Bächtold-Stäubli, Handwörterbuch des deutschen Aberglaubens, Vol.3,p.253). The final step in the preparation of the carrier substance is to expose the second powder to the smoke created from fire of myrtle wood and a pill of the first powder. The powder is not exposed directly, but contained within a satchel aligned in color and cloth to the planet in question. From the accompanying prayer to the planetary angel (Anael in our case), we understand that the first powder, which contained the ashes of the heart of the sacrificial animal, is offered as a sacrifice or ritual food to the angel itself. According to Medieval logic, the forces contained in the substance can only be absorbed in their bodiless form of smoke and smell by a being of equal nature. The previous steps of the operation provide the operator with what the author of the General-Key now calls the universal materia of the respective planet. However, this magical substance still 'cannot attain anything in itself as it lacks a soul and principal' (General-Key, page 11). Such soul now has to be infused by means of a process less focussed on the combination and sublimation of natural substances as the ones of the creation of our two powders. Instead this final step relates much closer to classical grimoire practice: After explaining his hesitancy to reveal this powerful and most critical step, the author provides instruction for the creation of a magical pentacle. Following the ritual use of fire, blood, plants and minerals, the written word is revealed as the ultimate magical agent. All previous steps focussed on creating the right circumstances to attract the presence, attention and benevolence of the planetary angel, as well as to capture their directing force in the universal materia. This last step alone, however, is what puts a spell on the person in question. Only this final act provides specific focus, direction and agency to the accumulated pool of specialised magical force. The universal materia created the body of the magical agent, the pentacle now enlivens it with a particular will and drive. The sigil is a graphical expression of the ritual goal, put under the blessing and sovereignty of the respective planetary angel: The names of the operator and the person they aim to make fall in love with them are written on virgin parchment, connected in their middle by the name of the planetary angel and captured within a star of as many points as their number relates to the number of the planet (six for Venus). Then the parchment pentacle is burned, its ashes mixed with the second powder, until their joint weight equals the number of the planet in grams. This final powder - the body and soul of the operation - is then drunken by the operator while wishing to good health of the person their spell intends to affect. The magical potion leverages the living body of the operator to return to nature, from where has access to all other parts of nature. The magic has become flesh. The title of our little work refers to one of the most daring undertakings of the human mind: Johan Trithemius' attempt to overlay in a single book an entire angelogy with instructions on a novel, spirit-based remote communications technology and again with a comprehensive master-course in secret decoding techniques. Our General-Key at hands, however, couldn't be more different in nature from this intellectual milestone of the Western human mind. While referring to Trithemius' Herculean task, it's attempt is not born from the oratorium of the scribe, nor the circle of a mage, but from the stained hands of the witch. The General-Key is a grimoire that emerges right out of everyday life and is determined to stay there. From the initial advise to attune one's virtues to the work in question, all the way to the preparation of the universal materia - the short text is not written with the centre of a magical circle in mind, but the centre of the operator's life. Looking at each step in detail, we in fact realise, its astral operation would have taken place much rather in a well equipped kitchen than a temple or church: the incinerating of animal parts, the bottling of blood, the pressing of leaves, powdering of roots, embroidering of satchels, and preparation and use of virgin parchment. As mentioned before, no classical magical paraphernalia are mentioned or needed, except for what can be found in a medieval kitchen already. What has to be protected above all, however the text informs us, is the virgin and full dedication of all tools only to the planet in question. Where Trithemius' General-Key draws its virtue and power from the splendour of the human mind, our grimoire draws on the raw and deeply rooted forces of the corporeal realm. Whether it is the body of plants, minerals, animals or the body of the operator themselves - they are all put to use, confined, combined and collimated into a single, corporeal 'universal materia'. The General-Key at hands follows the classical triad of first drawing out the forces of the corporeal realm, then drawing down the forces of the astral bodies and finally drawing in the forces of the created into the body of the operator itself. It is the second phase here that experiences most elaborate attention and instructions, and our small manifest presents a unique summary of the operational precision required to manifest the supra-lunar realm in a hybrid body of the sub-lunar one. In doing so, it leaves no doubt that all human senses have to be woven into such process - sight, sound, touch and taste - in order to integrate all facets of the corporeal world into a single magical process. Besides the comprehension and succinctness of its overview on general magical operating principles, the true value of this little gem might reside in tying these back into the realm of the senses. In bringing magic back from the temple to the kitchen, the General-Key binds magic back to the domestic locus of the human senses, the hearth. As such we should not imagine it to be special in any way; yet history has turned it so, as we preferred to sanitise and sublimate 'ritual magic' into an all too often abstract art which today can seem more attuned to the operator of a machine, than the guardian of a hearth. Magic, after all though, resides in the world not in our imagination. And what ties us as human beings from the latter to the former are our corporeal senses. Magic thus is best accessed through the gate of the body - and the General-Key is wonderful reminder of that simple truth.